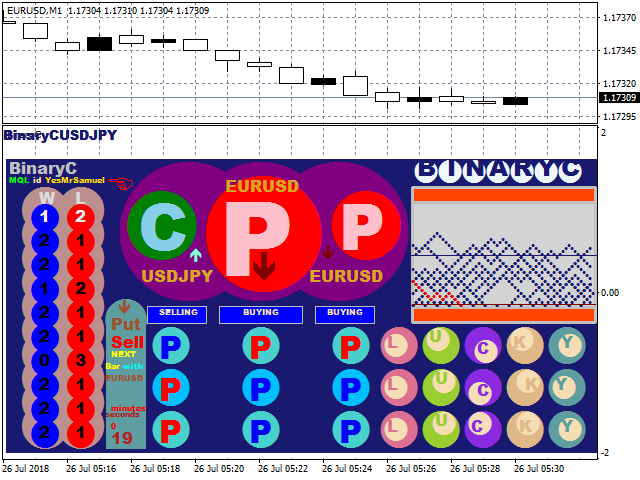 BinaryC is an indicator that helps forecast winning and losing probability of the next forex pair bar. It is designed to provide bull and bear order of formation. It can be used with any pair and timeframe. The winning and losing table shows the order of bull or bear with a KEY tag. The number beside total win, total loss, shows the order of bull or bear. For example: if the total win = 238-2, total loss = 643-7, this means there was an interval where bull was 2 and bear 7 or bull was 7 and bear 2. If total Call signal is greater than Put signal, and "1" dominate the winning and losing table, I will trade next 3 candles for Call. I will wait for the first 2 candles to lose then trade the 3rd candle to win. The symbol chart can either tick up or down, forming a new high and low, clearly showing a pattern at interval. So it is necessary to track down each candle and its mode of formation. The keys are given different task of the most common pattern formation. Each key take the input parameter jesu in to consideration as subject. As the price tick up and down, with subject jesu, each key start to count individually base on written algorithm. This works like moving average. Once the key is set in the input parameters, a new forecast will be shown for the next tick. BinaryC calculates the winning and losing probability, taking into consideration the immediate past tick/candle. 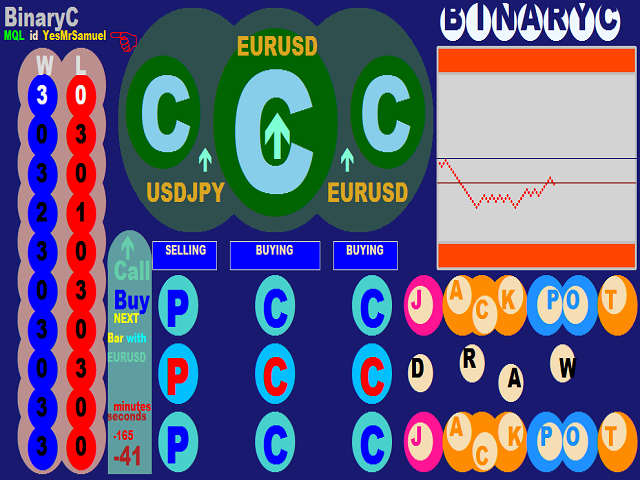 Trader needs counting ability if he or she cannot use BinaryC with martingale. The countdown timer means a trader should wait till the time end before placing an order. The expiry time of the signal is the current timeframe of the symbol available beside "byPO:OSAA".